For those with feet prone to swelling and circulation problems, we have a range of socks designed to suit your needs. Created for ultimate comfort, PhysiPod socks can be worn on all foot types. Machine washable and fade resistant, they have been manufactured using premium quality natural cotton to ensure ultimate comfort, breathability, durability and absorbency. Our sock range comes in three forms – the circulation sock, the non-slip sock and the silver sock. PhysiPod socks have been designed specifically for the swollen, painful, or Diabetic foot, however, they are equally suited for everyday use on the average foot. They have been manufactured using the highest quality natural cotton, to offer comfort, durability, breathability, and absorbency. The socks have a small percentage of spandex to help the sock retain its shape over time. When distal blood flow is compromised, or oedema is present, the PhysiPod sock is designed to not restrict blood flow any further. The sock’s design has graduated shaping along the shin, progressing to a loose knitted top, with a soft cuff. Making them perfect for problem feet! The sock’s footbed has a full terry base which cushions the foot, further aiding comfort, absorbency and ventilation. A fine hand finished seam at the toe and heel, avoids irritation of sensitive skin. 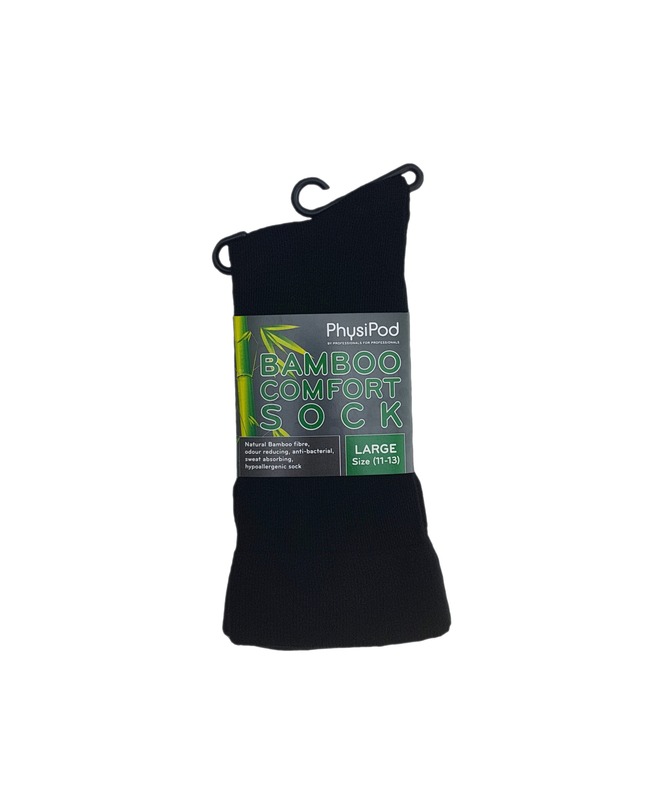 Practical and purpose designed for maximum comfort, foot pain or no foot pain, your clients will come back for PhysiPod socks! 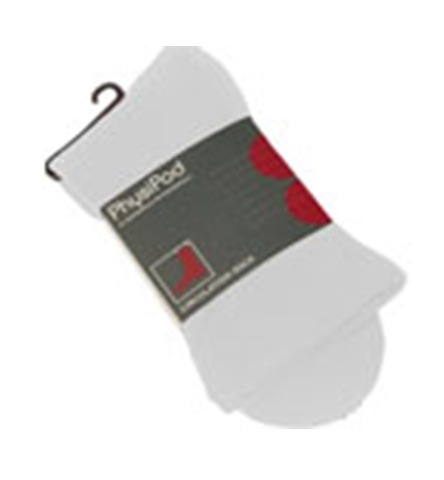 PhysiPod socks are recommended for the Diabetic client and for feet prone to swelling or circulation problems. Designed for ultimate comfort, PhysiPod socks can be worn for all foot types.They are machine washable and fade resistant. They have been manufactured using the highest quality natural cotton, to ensure comfort, breathability,durability and absorbenccy. When distal blood flow is compromised, the PhysiPod sock is designed to not restirict blood flow any further. The sock has graduated shaping along the shin, with a loose knitted top, soft cuff and hand finished seams. 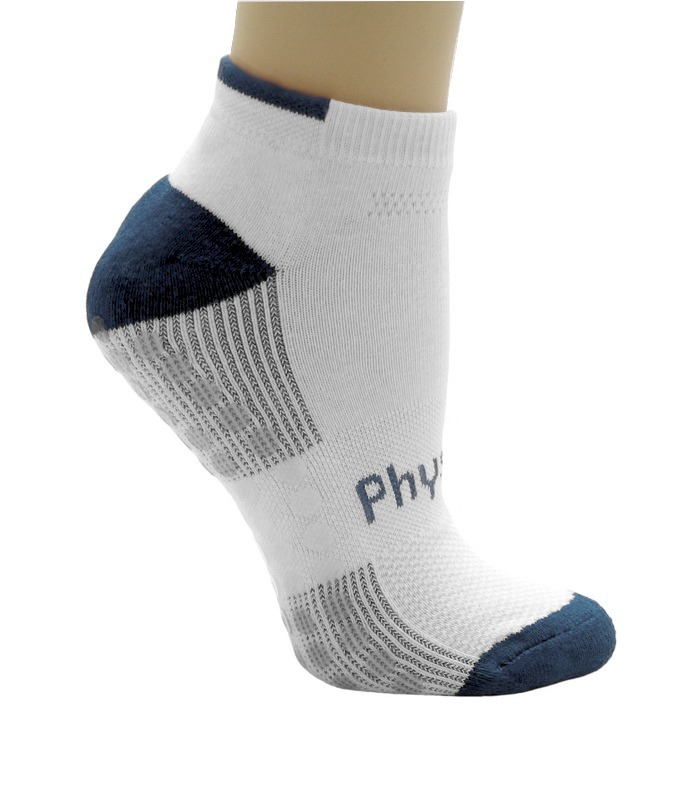 PhysiPod socks are perfect for all feet! Ideal for barefoot activities such as Pilates, Yoga, Tai Chi and anyone at risk of falls . 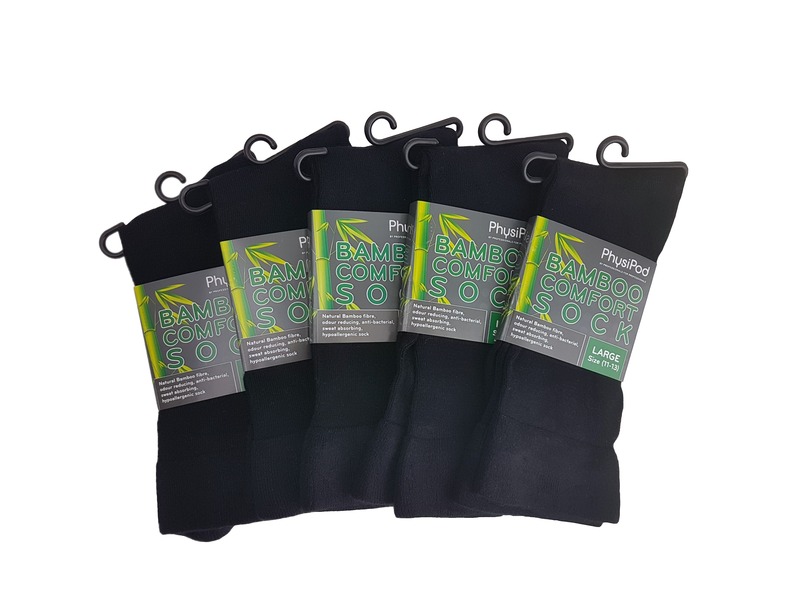 As part of our sock range, PhysiPod is proud to introduce our Non-Slip Socks. These are an ankle sock with several features for comfort, hygiene and safety. The socks are designed for anyone doing barefoot exercise classes and or, anyone at risk of falling. Class work such as Yoga, Tai-Chi, Pilates, Body Balance are all great examples of where you would use these socks. Exercise mats can often harbour unwanted bacteria, so to be safe and hygienic, take your own socks with you. They can also be used for the Elderly in Nursing Homes & Hospitals. The gel dots cover the entire underfoot of the sock and still have you covered when you are standing on your toes. The unique Gel Dots give you superior GRIP and stability whilst exercising and do not wash off !! The socks have a full Terry Base for comfort and support; Ribbed Arch support for added stability and to avoid ‘Sock Roll' Knitted Open Wear Mesh for breathability, wicking and improved circulation; Large Gel Dots for GRIP and traction. Made of : 80% Natural Cotton for comfort, softness and breathability; 15% Polyester for longevity; 5% Elastane for improved fit and shape retention. PhysiPod's Non-Slip Socks allow you to walk more safely in socks alone. An example would be a Post-Operative patient who is unable to put on a shoe for whatever reason, (swollen feet; painful feet; bandaged foot; and so on), but needs to be up walking as part of their Rehabilitation. 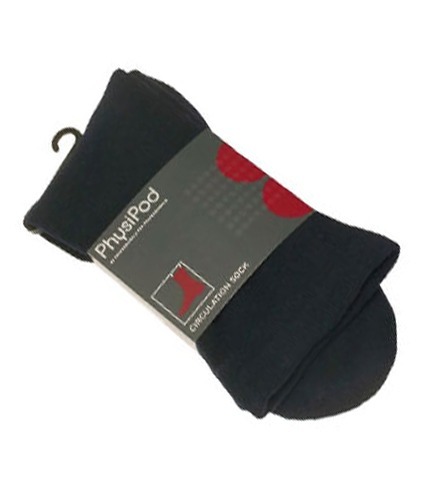 Instead of the shoe but just as safe, try PhysiPod's Non-Slip Socks. Be Safe. Be Comfy. Be Clean. Conductive garments are commonly recommended to patients by many Neurologists, Orthopedic Surgeons, Physiotherapists, Podiatrists, Chiropractors, and other Physicians and Health Care Practitioners for use in the treatment and management of pain associated with many conditions. 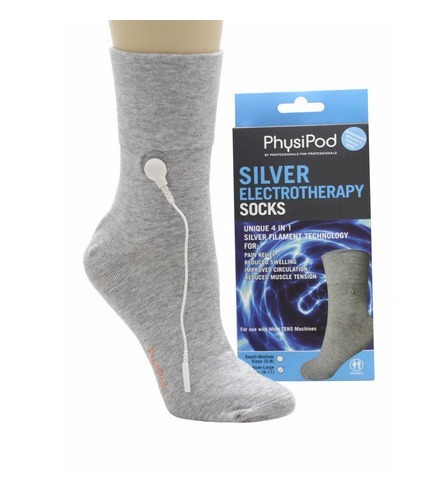 PhysiPod's Silver Electrotherapy Socks are woven with a special silver filament to maximize both conductivity and comfort. The silver nylon fibres ensure an even distribution of electrotherapy current throughout the whole area creating a therapeutic circuit with the sock. This allows for a full and even contact over the whole foot and ankle which cannot be replicated with electrodes. Thus making it comfortable and easy to use with the majority of TENS machines. It is the PERFECT accessory to go with any of the PhysiPod Electrical Stimulators- The TU2, (Dual Channel TENS and EMS); The TU4, (Quad Channel TENS & EMS); The MT8000, (Multi Modality Stimulator with TENS / INTERFERENTIAL THERAPY / MICROCURRENT / & EMS). Sock Composition: 65% Cotton / 30% Silver / 5% Spandex. 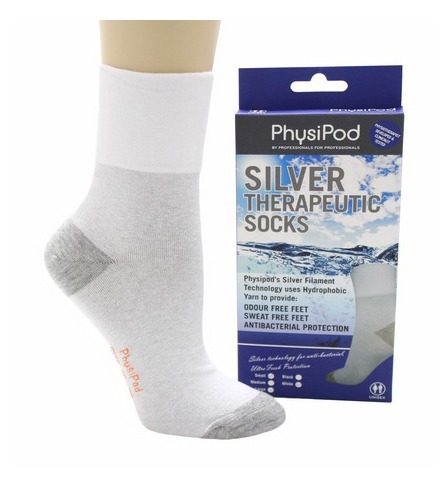 PhysiPod's Silver Therapeutic Socks have been specifically designed for the sweaty or malodorous foot & for the high risk foot, such as the swollen, Diabetic, or Arthritic foot. It is equally comfortable for the Athlete and the High Risk Foot, helping to wick moisture away from the skin, allowing better Thermoregulation and moisture control and relief from Chronic Foot Odour. The Silver Therapeutic Socks are : • Strong in Natural Anti Bacterial Protection • Able to control Athlete's Foot & Foot Odour • Able to control Sweaty Feet (Hyperhydrosis) • Ideal for the High Risk foot- Diabetics/Arthritis • The Ultimate in Performance & Durability, for Athletes and ‘at risk' feet • Superior in design, with ‘Built in Silver Technology' that cannot be washed off • Able to Wick moisture for all day freshness & cool dry comfort • Durable Performance for the Lifetime of the sock • Seamless toe & heel for comfort • Ultra Fresh Protection Step out with confidence and freshness, Treat your Feet, they deserve it.